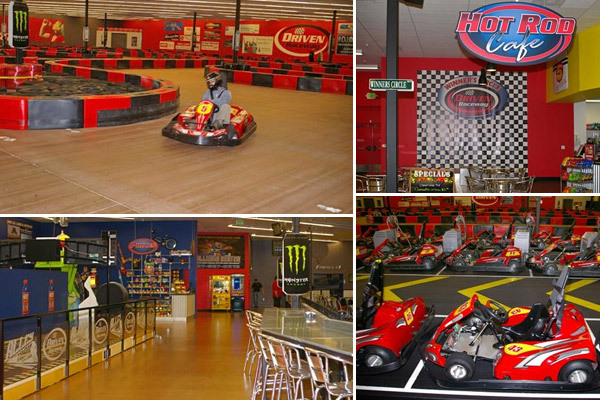 To create the Driven Raceway facility, 36,000 square feet of a vacant retail building in Rohnert Park was gutted and remodeled. Existing floors were stripped bare and the concrete was either stained in many areas or bead blasted for the racetrack. To reduce costs, much of the existing restrooms, ceiling, lighting and HVAC systems were kept in place and modified. Charging stations were installed in the pit area for the electric race karts. Interior décor was a combination of industrial and racing motifs, with bold colors, corrugated metal, chain link fencing, sheet metal dining counters and exposed steel. The facility includes an administrative office, commercial kitchen, café, party rooms, black light mini-golf course and mini-bowling. A large game arcade completes the facility, which has become a popular recreation spot for local youth, young adults and kart racing fans.